We had a lovely sunny day here today so our little sun room is one of my favorite spots to be when it has been warmed by the rays of the sun. It is still cold in here at night in February but by next month I will be able to move some of my plants out here that I have wintered over. For now it is a cheery spot to enjoy a cup of tea with a pretty bouquet of tulips. Maybe, I should mention that this sunroom is upstairs off our bedroom and bath and it over looks the south and east gardens. Our locally grown tulips from Vanco brighten my days in the winter while I wait for my own to come up in the garden. The little garden fairies were a gift from my daughter. Hyacinths make the sun room smell so good! 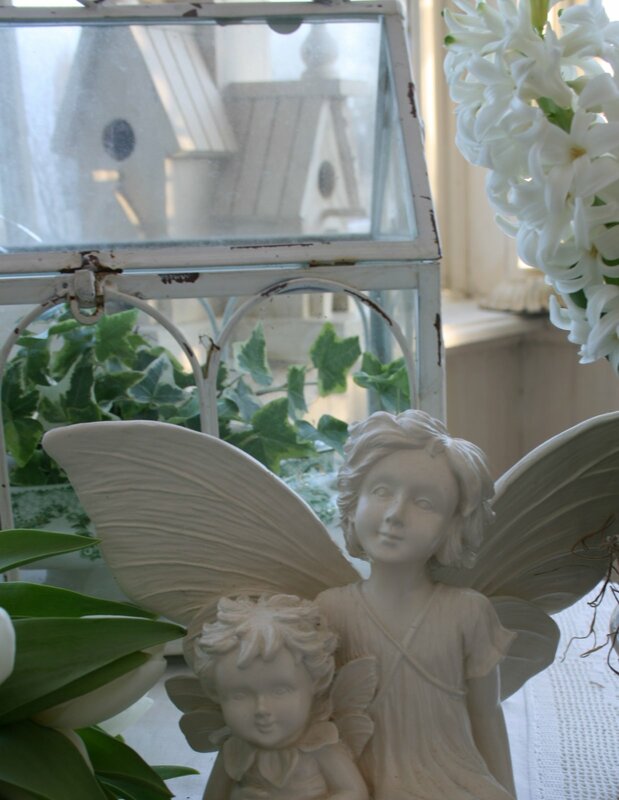 I got this urn from a Summerside flea market and painted it creamy white. I love all colors of tulips but pink is my favorite. 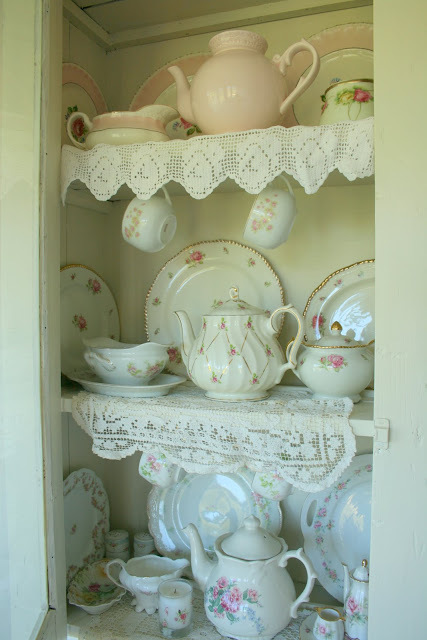 I know I shared this old cupboard before when it had a makeover but it hangs on the wall in the sunroom so I thought I would share it again. I opened the doors so you could see the dainty pink and white china that is inside better. I love to make little changes in here from time to time so you might have noticed that in the pics, as some are recent but some are last years. Tomorrow , I am going to enjoy making up the plant order for Fanningbank gardens as I am on the committee there and it is my job to pick the annuals for the beds, Last year was my first year and I was somewhat intimidated by it but this year it will be more fun. 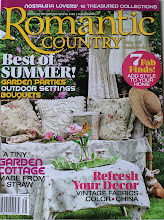 So, if it is sunny you will find me here with my seed catalogues and a cup of tea. Maybe, you would like to help me? 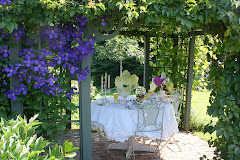 I am joining Cindy again at My Romantic Home for Show and Tell Friday-be sure to check it out too! 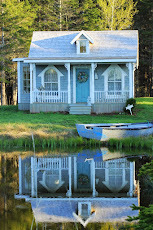 Your home is unbelievably beautiful, I would never go anywhere if I lived there...ever!!!! 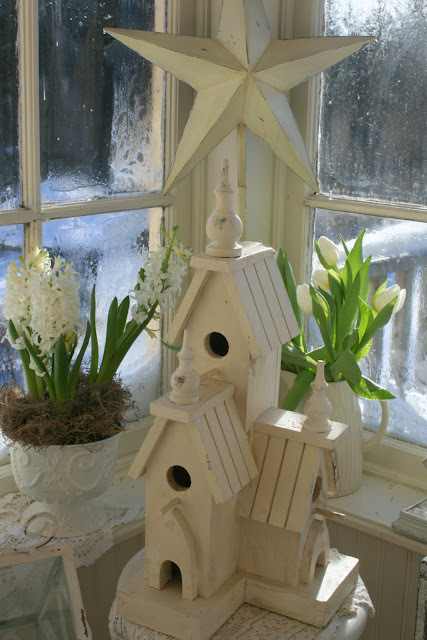 Your Sun Room is simply beautiful and to see the railings outside covered with snow makes it especially warm and inviting... lovely! Fico maravilhada cada vez que venho aqui...não tenho nem palavras para comentar. Voce tem um bom gosto incrível, suas louças são fantásticas, e as imagens nos deixam encatadas. Não me canso de olhar, e venho aqui no seu blog várias vezes por dia. Stunning...I want to be in this room! It definitely looks like SPRINGTIME in here!!! Your sunroom is bound to make Spring envious! 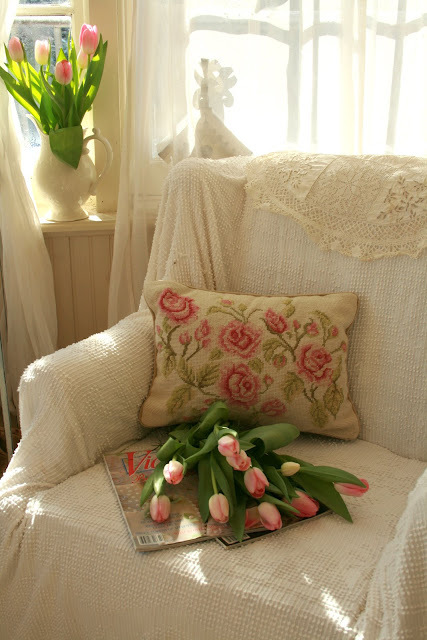 Tulips, tea and a good magazine...you have provided just what I'd like for spending some time in the sunroom with you Carolyn. A very sweet sun room to enjoy!!! Your home is so lovely!!! Oh la la, the pictures are so beautiful of your home! All of the white and soft pinks! Love it. It sounds so fun to help with the garden bedding. Today it got up to 71 out, but the ground is still frozen solid. I wish I was there to enjoy a cup of tea with you. It looks so relaxing! Thank you for sharing. Good luck with your seed purchases. Your sunroom is so beautiful especially with the glimpse's of the snow in the background. I am envious of an upstairs sunroom. I'm sure a sunny day was so welcomed especially in your sunroom. Just beautiful. Carolyn I don't know where to begin! What a romantic room and it's off your bedroom too! 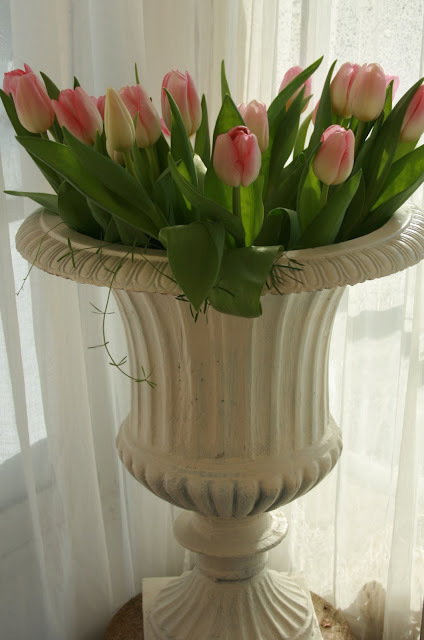 I love the pink tulips in the white urn...pink tulips are my favourite! Love the cabinet with all the pretty china! Such beauty in every photo in your post! Lovely vignettes everywhere. Boy did i enjoy seeing a geranium in bloom! What a great room, and the tulips are beautiful! 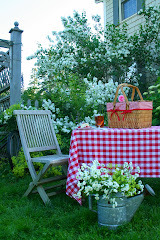 your home is beautiful....a dream for me !i like your blog very much! ooh love your sunny room! What a romantic place! I can see why this is a favorite place in your home for you. I love our sunroom, too. Hi Carolyn, This is so beautiful it's hard to put it in words!! 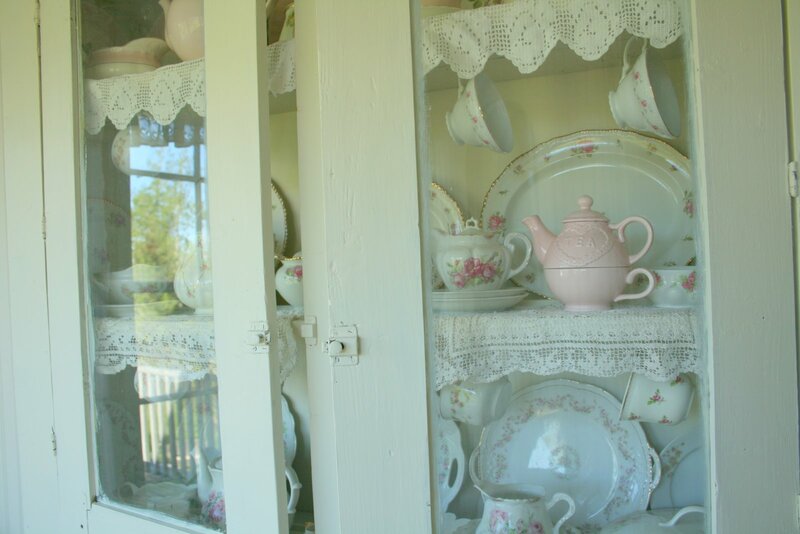 Your china cabinet is so gorgeous.I would love to be sitting in your sunroom right now!! Carolyne, You have such a pretty spot to wait out the winter! 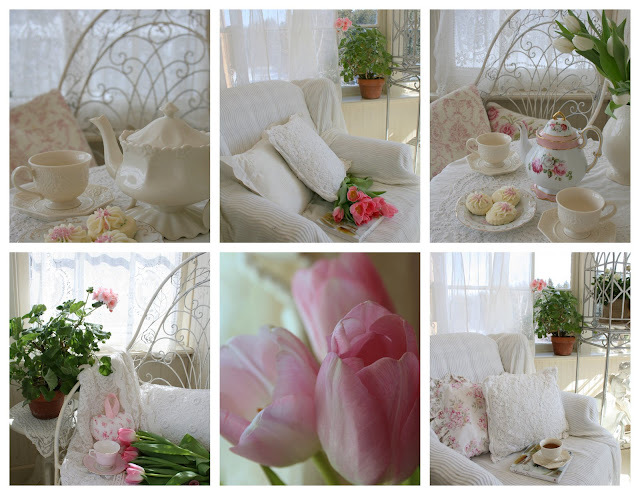 Feels like spring in the sun room! HI Carolyn,what a lovely spot in the sun to read or relax...I was wondering how you are making out with the blog header problem? Have you had anyone help you understand why it disappeared and are there any solutions at hand? What a room you have. Your home is so beautiful and inviting, wish I had such a sun room here. We're having cold winds here today so even if it's sunny, it's so cold. I love the sun though only wish the windows wasn't that dirty, lol. 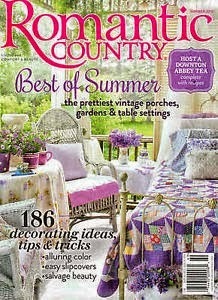 Yours is a most beautiful sunroom! I could happily live the rest of my life right there. You have the most wonderful taste in designing. Happy Friday to you! I love your sun room, it is gorgeous! Dear Carolyn, I really love this room full of brightness... and I adore your flowers! 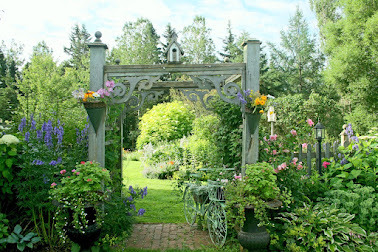 Dear Carolyn, your home always beautiful at every corner! 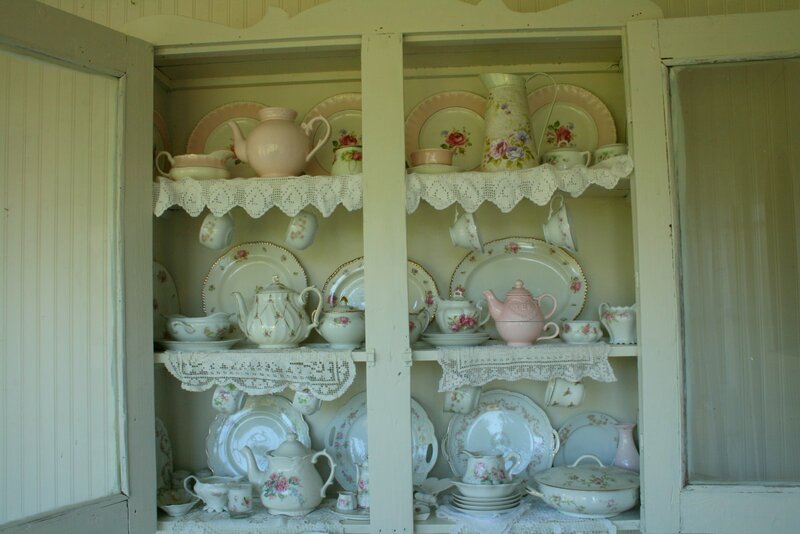 love your china cabinet with pinky roses china! my fave kindda room! love it! Carolyn, I have to tell you that you have published some gorgeous posts...but this one has to be in my top ten favorites of all of them. It is pure magic!!!! This room must be a haven in Summer. The magic you create here on your blog tops anything I ever seen on any blog. You are making it hard for me not to be sorely disappointed in almost every magazine I buy, whether it be garden or home decor. 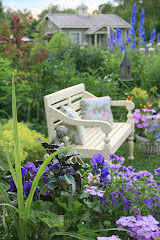 I hope you have a wonderful time ordering the plants for the garden....they are so blessed to have you. I think this must be one of my favourite posts! Your sunroom looks so peaceful and quiet. 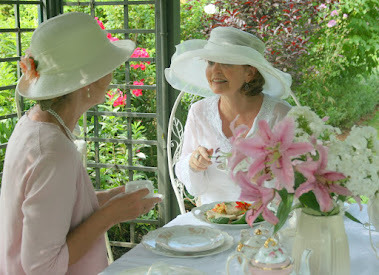 I wish I could join you there for a cup of tea. I think of all the porcelain you have, the porcelain you show us today is my favourite; the flowers, the pastels....It's simply beautiful!! I enjoyed the Kings Speech very much. I hope Colin Firth and the Australian actor will get their Oscars! 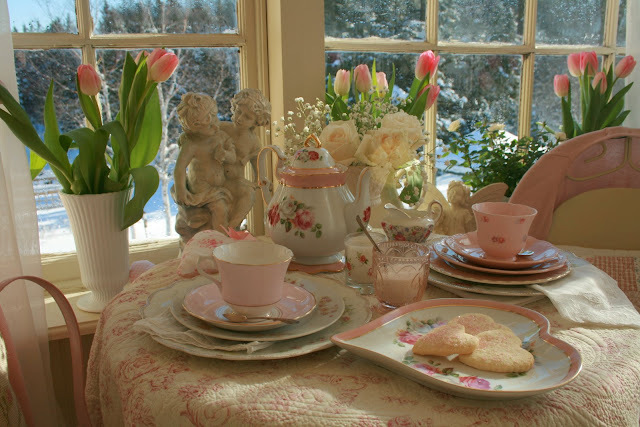 Oh my goodness - your sun room is so lovely - what a beautiful room to sit and relax with a cup of tea and order seeds and flowers for Spring. The pink tulips are delightful. I will love to follow your blog in the future. Thank you for sharing! Hello. Beautiful, so beautiful! 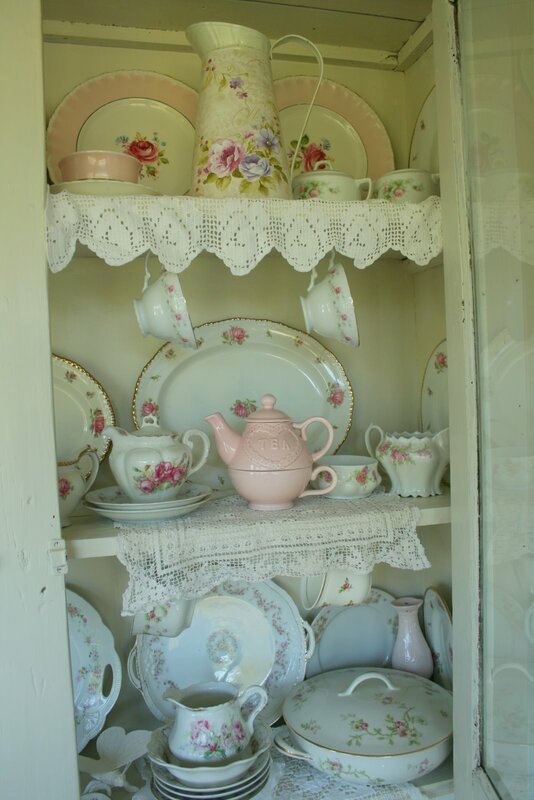 I love pink and white, so much. This is oh so very lovely. Beautiful! I'm enjoying your beautiful photos of your beautiful things! What a bright and cheery space! Dear Carolyn, I imagine the sun smiles when it is able to fall into your world! Enchanting! Your photographs are stunning. How lovely to have locally grown tulips! I can get freesia now from a nearby florist's greenhouse. We become spoiled with the freshness don't we? I love how you play with the tulips throughout and admire how you arrange them. What dear fairies your daughter gave you and they could not have been brought to a more magical realm! Everything you touch becomes beautiful and beguiling in the most sweet and comforting ways. Delight indeed :) very beautiful! 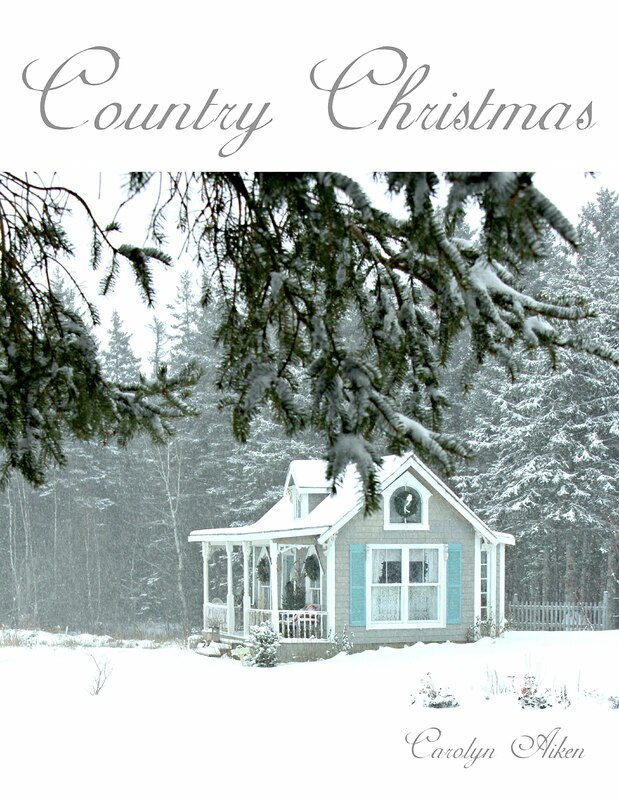 A friend of mine found this blog and told me to cheeck this out...I am so glad I did! 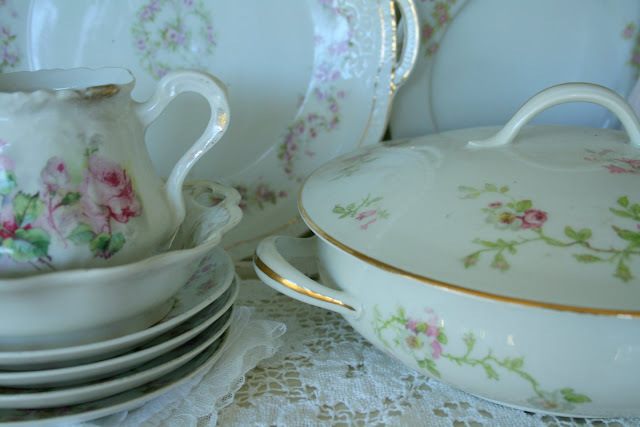 What a beautiful sunroom you have...and the china is to die for! 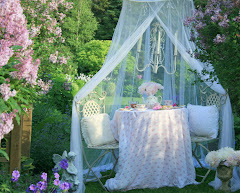 I absolutely love pink and think you are definitely right up my alley with that. I just recently started my very own blog, feel free to stop by and leave any suggestions. 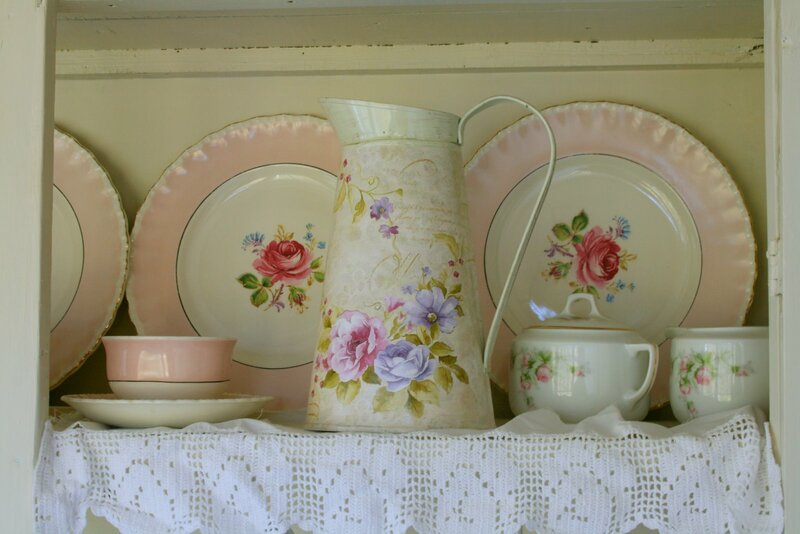 I would love to know where you found the pink plates with the roses in the center. Thanks so much for sharing! Hi Carolyn, you have a sunny sun-room! And I must appreciate your designing skills. Happy weekend! cudownie, beatiful, pozdrowienia z Polski!